New for 2019 – the DMO stock range! We have been working hard over the past few months to try and reach more and more patients through providing a superior orthotic solution that is more easily accessible. Enter the DMO stock range! The DMO shoulder stability orthosis is designed to manage shoulder impairments. 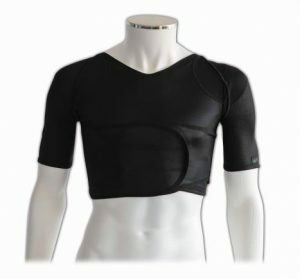 Developed from extensive research, its unique design pulls the shoulders back, supports the shoulder blades and stabilises the shoulder joints, providing greater comfort, improved posture and range of movement. They come in a range of sizes ranging from XS to XL with the options of female/male or black/beige*. CLICK HERE TO VISIT OUR ONLINE SHOP AND BUY YOURS TODAY! The DMO stock stability shorts have been designed to aid lower limb function and posture whilst increasing core and pelvic stability. They come in a range of sizes ranging from XXS to XXL with the options of male adult/ female adult/child or open*/closed crotch or black/beige*. You can purchase the DMO shoulder stability orthosis and DMO shorts in a range of stocked sizes whilst still receiving benefits from the core DMO orthoses. Still want to go bespoke? That’s absolutely fine! We are still providing our bespoke made-to-measure orthoses, please contact admin@dmorthotics.com who can point you in the direction of your nearest DMO clinician.